The People’s Bank of China announced on September 15th the issue of two new collector’s coins marking the 100th anniversary of the start of the 1911 Revolution. The Wuchang uprising which began on the 10th October is considered the catalyst to the Xinhai Revolution which brought an end to China’s 2000 year old Imperial Government with the abdication of Aisin-Gioro Puyi (or Henry Pu Yi as he was later known) then, the 5 year old Emperor of China and 12th Qing Emperor who had ruled for only 3 years. The two coins, one struck in gold (100 Yuan) and one in silver (10 Yuan) carry designs symbolic of the milestone event which transformed China into a Republic under its first president from the 12th February 1912. Both coins are produced at the Shenyang Mint Co., Ltd. 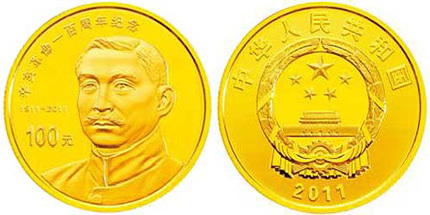 The gold coin’s obverse depicts China’s first president, Sun Yat Sen, in full face along with the commemorative years “1911 – 2011” to the left of the portrait and the commemorative text “辛亥革命一百周年纪念” (Revolution Centennial) in Mandarin above and to the left. The reverse of the coin shows China’s official insignia along with the Chinese People’s Republic legend in Mandarin above the crest and the year of issue 2011 below. Struck to proof quality, the coin is minted in .999 fine gold and weighs 7.77 grams (1/4 ounce) with a diameter of 22 mm. The total mintage is authorized at 100,000 pieces. 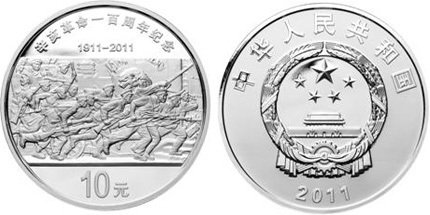 The obverse design of the silver coin features an image of the Republican guard in battle along with the commemorative inscription in Mandarin “辛亥革命一百周年纪念” (Wuchang Uprising) above the main design along with the anniversary years “1911 – 2011” just underneath. The coin’s denomination of 10 Yuan is seen below the main design. The reverse design includes the official insignia along with the year of issue “2011” below the crest. The coin is struck to proof quality and minted in .999 pure silver with a weight of 31.1 grams and a diameter of 40 mm. A total mintage is authorized at 160,000 pieces. Both coins have an official date of release of the 27th September. The People’s Bank of China does not have direct sales to collectors but there are various distribution dealers for North America and Europe.